A classic recipe with great texture and flavor! 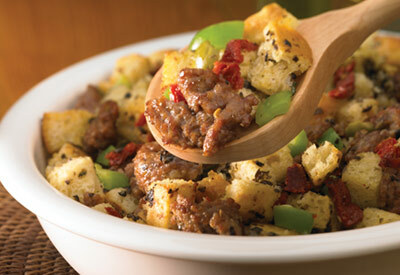 In a skillet, cook and crumble sausage in 1 tablespoon oil until no longer pink; set aside. In a large bowl, combine bread cubes and the remaining oil. Sprinkle with pepper; toss to coat. Transfer to a greased 15- inch x 10- inch baking pan. Bake at 350 degrees F for 10 minutes or until crisp and a lightly browned, stirring once. Remove pan to a wire rack to cool slightly. In a very large bowl, combine the bread cubes, reserved sausage, Parmesan cheese, green pepper, sun-dried tomatoes, olives, basil and garlic. Combine eggs and water; pour over bread mixture and toss to coat. Transfer to a buttered 13-inch x 9-inch baking dish. Dot with butter. Bake, uncovered, at 350 degrees F for 35 to 40 minutes or until hot. *If using Johnsonville Italian Sausage Links, remove the casing by cutting the sausage link end to end, about three-quarters of the way through. Flip sausage link over, grasp casing and pull off. All Varieties of Coke, 12 or 8 pack. Only valid on Free Canada Dry Orangeade or Lemonade Gingerale 12 pack.